The coming year is likely to be as full of surprises in the field of energy as 2014 was. We just don't know which surprises! I am not predicting that any of the following will happen, and they will be surprises to most people if they do. But, I think there is an outside chance that one or more will occur, and this would move markets and policy debates in unexpected directions. 1. U.S. crude oil and natural gas production decline for the first time since 2008 and 2005, respectively. The colossal markdown in world oil prices has belatedly been followed by a slightly smaller, but nevertheless dramatic markdown in U.S. natural gas prices. The drop in prices has already resulted in announcements from U.S. drillers that they will curtail their drilling operations significantly next year. But drilling that is already contracted for will likely go forward, and wells waiting for completion will be completed. It can be costly to pull out of drilling contracts. And, failing to complete already successful wells and bring them into production is downright foolish since the costs incurred in drilling the wells including future debt payments remain. In those circumstances, some revenue at lower prices is preferable to no revenue at all. Regular readers know I often write about energy, and while this piece may not at first blush seem like an energy story, you'll soon see that the quest for an ample supply of energy is, in fact, at the heart of human greed. Greed is often said to be a central cause of our ecological and social ills. It motivates excessive and injurious exploitation of the planet and thus threatens the existence of many species including humans themselves. It leads to excessive economic inequality and the social ills presumed to be associated with that inequality. And, of course, greed is regarded as not just bad for the biosphere or society; it's bad for the soul and therefore earns a place on the list of the seven deadly sins. Many people are convinced that greed is learned and therefore can be unlearned or not taught in the first place. Others believe that greed is simply an inherent evil in humans, part of the human condition. If you work in the oil industry, you will not. If you work in the renewable energy industry, you will not. If you work in the energy efficiency business, you will not. If you work to address climate change, you will not. If you have investments in the oil industry (and nearly everyone does through pensions or 401k plans), you will not. If you live in a country that exports a lot of oil (not just Saudi Arabia, but Mexico, Canada and Norway, too), you will not. OPEC has declared war on American oil production with the intention of making the country more dependent on imported oil and on oil in general. By refusing to cut production in the face of weakening world demand, the cartel has allowed oil prices to fall more than 35 percent since mid-year to levels that are likely to make most new oil production in America's large shale deposits unprofitable. That could not only halt growth in U.S. production, but may lead to an actual drop because production from already operating deep shale wells declines about 40 percent per year. The United States could chose to fight back and possibly win this war with OPEC by employing one simple, big move. But, I can confidently predict that the country will not do it. Why? Because it involves a tax, a tariff actually. Back in 1975 then-Secretary of State Henry Kissinger proposed that the world's oil importers adopt a floor price for oil. The purpose was threefold: 1) encourage domestic oil production, 2) accelerate the development of alternative energy sources by making their price more competitive with oil and 3) encourage conservation of oil and oil-derived products such as gasoline and diesel fuel. To paraphrase Mark Twain: Rumors of OPEC's demise have been greatly exaggerated. Breathless coverage of the rise in U.S. oil production in the last few years has led some to declare that OPEC's power in the oil market is now becoming irrelevant as America supposedly moves toward energy independence. This coverage, however, has obscured the fact that almost all of that rise in production has come in the form of high-cost tight oil found in deep shale deposits. The rather silly assumption was that oil prices would continue to hover above $100 per barrel indefinitely, making the exploitation of that tight oil profitable indefinitely. Anyone who understood the economics of this type of production and the dynamics of the oil market knew better. And now, the overhyped narrative of American oil self-sufficiency is about to take a big hit. The possibility of a new Cold War between Russia and the United States and its NATO allies brings with it the spectre of nuclear war, an all-but-forgotten threat since the breakup of the Soviet Union in 1991. Even as the number of nuclear weapons has declined through mutually agreed reductions from a worldwide total of 68,000 in 1985 to an estimated 16,400 today, the destructive force of such weapons is so great that if the remaining ones were used, they might well spell the end of human civilization as we know it. One indication of the rising threat is what NATO calls an "unusual" increase in Russian military flights over Europe involving so-called Bear bombers, long-range Russian counterparts to American B-52 bombers. But, of course, U.S. and Russian nuclear forces have been operating all along since the end of the Cold War even as their arsenals were being slashed. The threat of nuclear war was always there even if tensions were falling between Russia and the United States. Did Russia and China just sign a death warrant for U.S. LNG exports? There were no doubt celebrations last week in the boardrooms of corporations that own patents to the world's genetically engineered crops. Proposals to label foods containing these crops--commonly called GMOs for genetically modified organisms--were defeated soundly in Colorado and barely in Oregon. That makes for a perfect record in the United States for the GMO purveyors who have beaten back every attempt to mandate labeling of foods containing GMO ingredients. But, I think the celebrations may be premature. For the advocates of labeling have vowed to fight on. They came within a hair's breadth of reaching their goal in Oregon. Who is to say that another round of voter education might not put them over the top? And, that is the danger for the GMO patent holders. If just one state requires labeling, the food companies will have to make a choice: Special handling and labels for one state or one label for the entire country that also meets that state's standards. * If the first state to implement a GMO labeling requirement is populous, say, California or New York, the decision will be made for the food companies. It won't be sensible to segregate supplies for that state. And, even a less populous state might tip the balance. Some states have passed GMO labeling laws that require enough other states to pass such laws to reach a minimum population threshold of in one case 20 million before the law goes into effect. Is there really an oil glut? Back in March 1999 "The Economist" magazine carried a cover photo of two men drenched in oil as they attempted to close a faulty valve that was spraying a huge stream of crude skyward. Over the photo was the headline: "Drowning in oil." At the time it really did seem as if the world were drowning in oil. The previous December crude oil on the New York Mercantile Exchange touched $10.72 per barrel. That month U.S. gasoline prices averaged 95 cents per gallon. "The Economist" opined that oil might go down to $5 per barrel. But, of course, in retrospect the magazine's cover proved to be the perfect contrarian indicator, for oil had already begun its historic ascent toward $147 per barrel. The 2008 price spike was the culmination of a 10-year bull market that had begun in December 1998. I'm taking a short break. I expect to post again on Sunday, November 2. Here's why I missed posting this week. I've been helping to publicize a new report by the Post Carbon Institute that takes aim at the Energy Department's rosy forecasts for tight oil and shale gas. That report is now available. For the full media kit, click here. When the world's business editors sent their reporters canvassing to find out what is behind the recent plunge in the world oil price, they were doing what they do almost every day for every type of market: stocks, bonds, currencies, commodities and real estate. In financial journalism more often it's the price that makes the story rather than the story that makes the price. If a story is about something very surprising which almost no one can know in advance--a real scoop--say, an unexpected outcome in a major court case affecting a company's most profitable patent, then the story will move the price of the company's stock. I've been advancing a thesis for several months with friends that World War III is now underway. It's just that it's not the war we thought it would be, that is, a confrontation between major powers with the possibility of a nuclear exchange. Instead, we are getting a set of low-intensity, on-again, off-again conflicts involving non-state actors (ISIS, Ukrainian rebels, Libyan insurgents) with confusing and in some cases nonexistent battle lines and rapidly shifting alliances such as the shift from fighting the Syrian regime to helping it indirectly by fighting ISIS, the regime's new foe. There is at least one prominent person who seems to agree with me, the Pope. During a visit to a World War I memorial in Italy last month Pope Francis said: "Even today, after the second failure of another world war, perhaps one can speak of a third war, one fought piecemeal, with crimes, massacres, destruction." In citing many well-known causes for war, he failed to specify the one that seems obvious in this case: the fight over energy resources. It can be no accident that the raging fights in Syria, Iraq, Libya, and the Ukraine all coincide with areas rich in energy resources or for which imported energy resources are at risk. There are other conflicts. But these are the ones that are transfixing the eyes of the world, and these are the ones in which major powers are taking sides and mounting major responses. Conceptually, the battle is over. The peakists have won. I was sitting next to an oil executive in New Mexico just recently, and he said to the audience, "Of course, I'm a peakist. We're all peakists. I just don't know when the peak comes." But that represents part of a conceptual victory. And, therefore to the peakists I say, you can declare victory. You are no longer the beleaguered, small minority of voices crying in the wilderness. You are now mainstream. You must learn to take yes for an answer and be gracious in victory. Some five years ago in Italy, I concluded a talk by saying that like the inhabitants of Pompeii, who ignored the neighboring volcano Vesuvius until it detonated, the world ignores peak oil at its peril. I'm taking a short break this week and next and expect to post again on Sunday, October 5. Are we on the path of 'Limits to Growth'? Probably the most important thing you need to know about the 1972 book entitled Limits to Growth is that it makes no predictions. Rather, the much maligned study provides scenarios for thinking about the future of resource use, pollution, population, food, and industrial production. Limits to Growth detailed three scenarios originally, one of them called business-as-usual or BAU. Since then, countless scenarios have been run using the same model--called World3--and some of them are discussed in updates to the book, the most recent published in 2004. Many of the scenarios including BAU result in a collapse of industrial production and population some time this century. What has surprised those reviewing the model used by Limits to Growth researchers is how closely reality has tracked the original BAU scenario. A recent review suggests that the signs of societal collapse may be around the corner based on the observed trends. But the components of that model have yet to turn in deleterious directions which would suggest trouble. It is a staple of apologists for the chemical and fossil fuel industries to say, "We have no proof that what you are talking about is dangerous." Let me restate that in probabilistic terms: "We are highly uncertain about the harm of what you are talking about." When stated in probabilistic terms, uncertainty about harm becomes much more alarming. Nassim Nicholas Taleb has added to a working paper which I discussed last week entitled "The Precautionary Principle: Fragility and Black Swans from Policy Actions." As I suggested in last week's piece, climate change is an obvious candidate for the precautionary principle because climate change involves the risk of systemic ruin. In his addendum Taleb explains that climate change deniers who criticize climate models for their uncertainty don't have the slightest clue what that implies. Rather than suggesting that we should ignore such models, the uncertainty suggests that we should be even more diligent about mitigating climate change since the high uncertainty means, probabilisticly speaking, that we have larger exposure to catastrophic outcomes. The destruction of all life on Earth is not 10 times worse than the destruction of one-tenth of all life on Earth. It is infinitely worse. A fall of 1 foot is not one-tenth as damaging to the human body as a fall of 10 feet, nor is it one-hundredth as damaging as a fall of 100 feet (which is very likely to be lethal). Walking down a stairway with one-foot-high steps, we are typically immune to any damage at all. Thus, we can say in both instances above that the harm rises dramatically (nonlinearly) as we move toward any 100 percent lethal limit. It is just these properties--scope and severity--that most humans seem blind to when introducing innovations into society and the environment according to a recent paper entitled "The Precautionary Principle: Fragility and Black Swans from Policy Actions." The paper comes from the Extreme Risk Initiative at the New York University School of Engineering and one of its authors, Nassim Nicholas Taleb, is well-known to my readers. Why does anyone even care about the future? The human community spans not only space but time. Naturally, we include in our community those closest to us--family and friends--and then in concentric circles of affiliation our co-workers; our fellow churchgoers (if we do that kind of thing); members of a civic group, a book club or a sports team to which we belong; the inhabitants of our town or city, of course; and our country. Some people even count themselves as citizens of the world. And, while we tend to reserve our deepest feelings for those closest to us, worldwide telecommunications makes it possible for nearly everyone around the globe to feel something for those very far away who lead very different lives. Recently, for example, our sympathies have been directed toward those suffering and dying from the Ebola virus. But, the human community also spans time. We include not only those alive today, but those who've lived before us. They might be departed parents and grandparents. They might have disappeared generations ago and exist now only on a family tree and as an association with an heirloom. We might also remember a whole culture (say, ancient Greece or Rome) now gone and which we know only through its artifacts and writings. We look for guidance from the ancients, from founders of our respective countries and from those considered wisest in our history both through written accounts and now increasingly through audio and video captured while they were alive. For years my father--who is a really great guy--has been telling me that I'd be a happier person if I didn't write about all the converging threats bearing down on the human race. Turns out he's right! Recent evidence suggests that a state of good mental health is associated with biased processing of information that supports a positively skewed view of the future. Depression, on the other hand, is associated with unbiased processing of such information. It has long been my contention that one of the chief symptoms of the age of constraints we have now entered would be the decline of public health systems globally. This comes at a time when our vulnerability to a worldwide epidemic is increasing because of widespread international travel, the proliferation of densely populated megacities and the general trend toward urban living. Of course, urban environments are ideal for spreading disease because of the proximity of the residents. The sudden re-emergence of the deadly Ebola virus is testing whether public health systems are adequate to the job of containing such threats. While we know that there is a link between the general health of a population and public health expenditures, it is difficult to find statistics on expenditures worldwide by country to assess the direction of public health spending. We do have evidence that declining health spending in Greece in the aftermath of the financial crisis there was followed by demonstrably worse outcomes. And, the medical community thinks the United States is spending too little on public health, just $251 per person (in 2012). Keep in mind that this is distinct from spending on medical care which totaled $8,086 per person. The science and practice of protecting and improving the health of a community, as by preventive medicine, health education, control of communicable diseases, application of sanitary measures, and monitoring of environmental hazards. It is a testament to the psychological power of financial bubbles that people who know and trust me and generally accept the analysis I've put forth in my writings over the last decade are jumping into the stock market again with a pledge that they are in for the long term--no matter what. Few would ever shop for a car, a house or even groceries the way people today are shopping for stocks--buying after the price has almost tripled. But a market experiencing a dramatic melt-up--26 percent for the S&P 500 last year and another 5 percent so far this year (8 percent when I first wrote this sentence)--has created a psychological contagion that is hard to resist. Who doesn't want to join in the mass euphoria experienced by others who are getting something for nothing? Now there was a time when investing in the stock market for the long term worked because the businesses that made up that market were supported by unconstrained supplies of energy and other critical resources. The undulations in the economy were due primarily to economic cycles. But as economist James Hamilton has pointed out, 10 of the last 11 recessions were preceded by an oil price spike. That's not definitive proof that the oil price was THE cause of any particular recession. But it would be hard to rule out oil as a major factor in those recessions. Why doesn't the 'long emergency' feel like an emergency? In 2006 when James Howard Kunstler published his breakthrough book The Long Emergency, the next two years seemed to vindicate his warning that the oil age was coming to an end with perilous consequences. Oil soared to $147 a barrel in mid-2008. A few analysts suggested that it was headed for $200; but that was not to be. By autumn the stock market had collapsed and with it the world economy. Oil, too, then collapsed, trading in the mid-$30 range by December as demand for oil fell off a cliff with the economy. It seemed for months that the world was headed for an economic depression. But extraordinary stimulative spending by governments around the world and emergency measures by central banks reversed the trend and led to a weak, but extended recovery of sorts that lasts to this day (though not for everyone--just ask the Greeks). Oil prices have rebounded and have remained at or near record levels for more than three years when measured by the average daily price of the world benchmark Brent Crude. That high price (higher on average than the year of the spike) is holding back economic growth. It is creating a seeming puzzle for economic policymakers who don't understand why their extraordinary measures have not led to extraordinary growth. They are blind to the central role of energy and particularly oil in the economy. I'm taking a short break. I expect to post again on Sunday, July 27. The Independence Day holiday in the United States has people here thinking about fireworks, parades and eating lots of barbequed meat. There will be many speeches on the gift of freedom which America helped to spread across the world. But there will be almost no introspection about what that word means. Freedom is one of those abstract words that politicians love to use in speeches because doing so allows everyone listening to project their own meaning onto the word (and to identify the politician as someone who shares their values). To some people freedom might mean freedom of conscience, to live by religious or moral tenets free from coercion by the state or the community. To others it might mean freedom of action to determine what course we want to take in life and to have the freedom to pursue it. But for many it has now become an amorphous rallying cry whenever patriotism is invoked--we are fighting for freedom, aren't we? But is it the freedom for each to think and act as he or she pleases no matter what? When I was a young boy, I was afraid of creatures I called "hoppers" who I believed lurked under my bed. They were patterned after leaping animated cartoon figures appearing in the closing credits of "Fractured Fairytales," a segment of the popular children's television program "The Rocky and Bullwinkle Show." My bedroom had to be checked each night for these creatures before I could enter and go to sleep. Of course, over time, the hoppers disappeared from under my bed. But, the world never quite lost its enchanted if sometimes menacing quality. Though only vaguely aware of it, I continued to react to animals, plants and just plain objects of all kinds as if they had unusual potency in the affairs of humans--potency with malevolent possibilities. As a young man in my 20s this peculiar version of reality became conscious to me when I read Swiss psychologist Carl Jung's essay entitled "General Description of Types." Since that day I have learned to sift carefully through my experience and thoughts for the undue influence of this psychological disposition and rigorously question any overly positive or negative conclusions that might have been influenced by it. I'm taking a short break and expect to post again on Sunday, June 29. Harvard economist Morris Adelman, famous for saying that we will never run out of oil, died last month. What followed the announcement of his death was a predictable set of encomiums like this one from defenders of the oil industry extolling Adelman's infinite wisdom. All of this makes sense only if you keep yourself from thinking about it. But a simple illustration will show just how meaningless the notion that we will never run out of oil is. Imagine for a moment that starting tomorrow one-half of the oil that human society normally consumes each day is no longer available and that this goes on for several months. Talkin' trash: Are we literally throwing away energy? Philipp Schmidt-Pathmann wakes up every day thinking about trash. What got him thinking about it in the first place is how much of it is simply dumped into landfills across America when most of what is not recyclable could instead be turned into energy for homes and businesses everywhere. Schmidt-Pathmann has seen a better approach in his native Germany where only about 1 percent of all municipal waste goes into landfills. This compares with about 68 percent in the United States of the 400 million tons discarded annually, he explains. (Exact numbers are hard to come by, but he prefers figures collected by Biocycle Magazine.) Germans recycle almost 70 percent of their municipal waste and burn almost all the rest to turn it into energy. Schmidt-Pathmann is founder and executive director of the Zero Landfill Initiative based in Seattle. He says that the United States could add 12 gigawatts (billions of watts) of electricity generation by expanding waste-to-energy facilities even if the country upped its percentage of recycling to that of Germany's. The United States currently recycles about 25 percent of its waste. Burning all the landfill waste currently available would provide an extra 33 gigawatts. That would be the equivalent of 33 large electricity generating plants. There is an important hidden lesson for climate activists in the vast downgrade of recoverable oil resources now thought to be available from California's Monterey Shale. Almost all climate activists have rejected any talk that the world's oil, natural gas and even coal supplies are nearing plateaus and possibly peaks in their production. That's because they fear that such talk will make the public and policymakers believe that climate change will be less of a problem as a result or no problem at all. Any yet, for obvious reasons climate activists rejoiced when the Monterey downgrade was announced. But this only served to highlight the fact that climate activists have lost control of the public narrative on energy and can only steal it back by including constraints on fossil fuel supply as part of their story. In fact, climate activists have been content to accept fossil fuel industry claims--the two parties agree on little else--that we have vast resources of economically recoverable fossil fuels, the rate of production of which will continue to grow for decades--unless, of course, climate activists stop this trend. This stance makes for an heroic narrative, but misses what is actually happening in the minds of the public and policymakers, minds which must be won over in order to address climate change effectively. Recently, I've taken another look at some of those episodes that I mostly dozed through in the mid-1990s as well as episodes of other Star Trek spinoffs. What stands out is how much the Borg, a collectivist race of ruthlessly efficient drones seeking perfection (as they define it), fit perfectly as the shadow side of the United Federation of Planets, presumably the good guys. 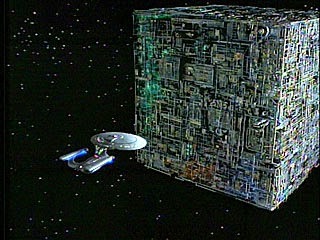 What comes into relief through this fictional contest is that it really represents an unconscious internal struggle in our modern culture; the Borg are the shadow side of our post-Enlightenment society. We hear so much from the fossil fuel lobby that the free market should determine our energy future--that government shouldn't favor one technology or fuel over another. When implemented, this view typically favors the incumbents which in this case are fossil fuels: coal, oil and natural gas. Very convenient. Now these are the same Koch brothers who say they hate taxes and anything that looks like a tax and certainly anyone who wants to raise taxes. But taxing solar panel owners is essentially what they are doing in an attempt to make increasingly competitive electricity from solar less competitive with fossil fuels. As the Obama administration puts off once again any decision on authorizing the Keystone XL pipeline, there are whispers of another intriguing possibility. If the U.S. government fails to approve the pipeline soon or rejects it outright, the Canadians may challenge the delay or rejection under the provisions of the North American Free Trade Agreement (NAFTA) signed by both countries. This move opens up a politically attractive option not previously available to the Obama administration, something I'll discuss below. I've been wondering about how NAFTA might affect any decision. Under its provisions, Canada is obliged to maintain the same ratio of exports to total production of oil and natural gas as prevailed in the previous 36 months regardless of the situation, that is, emergency or no. The pain of any voluntary restriction by Canada must be borne in proportion to its current consumption. Each party to the treaty would be obliged to suffer the same percentage decline in oil or gas deliveries from Canadian production. So, what if Canada decides to expand oil production from the tar sands and export that oil to Asia? Would that production be included in total Canadian production for the purposes of the treaty? Could the United States proceed against Canada for reducing the proportion that the United States is receiving from total production? A drilling foreman once told me, "Don't believe ANY reserve number unless it's linked to a price." And, that is just what petroleum geologist and consultant Arthur Berman and his colleague Lyndon Pittinger have done in a new report on the viability of shale gas in New York state. Not surprisingly, when Berman and Pittinger considered what it would cost to extract the shale gas beneath New York state at a profit, the mammoth claims about recoverable reserves made by the oil and gas industry appeared heavily inflated. 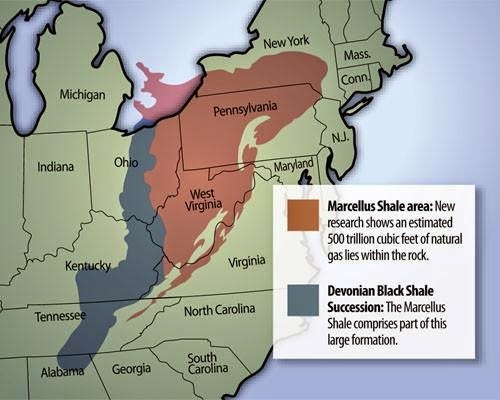 The stunning conclusion of the report is that at current prices--in the mid-$4 range per thousand cubic feet (mcf)--NONE of the natural gas trapped in the New York portion of the Marcellus can be profitably extracted. It's possible, of course, that someone would try. But, the economics look very shaky at current prices given what we know about the nature of the underground deposits. The United States today is a large net importer of crude oil and refined products. And, yet the story that the country can somehow export crude oil as a foreign policy measure to help reduce Ukraine's dependence on Russia won't die. Oil executives and their surrogates keep bringing it up, and unsuspecting reporters amplify a message that has absolutely no basis. The reason for this oil industry public relations blitz on the Ukraine is rooted in the industry's desire to end a decades-old ban on U.S. crude oil exports--one which the industry hopes to persuade Congress and President Obama to overturn. There is, in fact, a case regarding market efficiency for overturning the ban, but this is NOT the one the industry is using in its public relations campaign. Here's why: The major effect of lifting the ban would be to allow domestic producers to sell lighter grades of crude oil--which U.S. refineries have little remaining capacity to refine--to foreign refineries which do have spare capacity. Perversely, that would lead to GREATER imports of foreign oil--mostly heavier grades--more suitable for the current U.S. refinery infrastructure. Net imports would remain unchanged, of course, even as the country's oil supply becomes more vulnerable to events abroad. "Wait a minute," you must be saying. "Haven't we been hearing from the oil industry and from government and international agencies that worldwide oil production has been increasing in the last several years?" The answer, of course, is yes. But, the deeper question is whether this assertion is actually correct. Here is a key fact that casts doubt on the official reporting: When the industry and the government talk about the price of oil sold on world markets and traded on futures exchanges, they mean one thing. But, when they talk about the total production of oil, they actually mean something quite different--namely, a much broader category that includes all kinds of things that are simply not oil and that could never be sold on the world market as oil. I've written about this issue of the true definition of oil before. But Texas oilman Jeffrey Brown has been bending my ear recently about looking even deeper into the issue. He makes a major clarifying point: If what you're selling cannot be sold on the world market as crude oil, then it's not crude oil. It's such a simple and obvious point that I'm ashamed to have missed it. And, Brown believes that if we could find data that separates all these other non-crude oil things out, the remaining worldwide production number for crude oil alone would be flat to down from 2005 onward. Is ammonia the holy grail for renewable energy storage? "If you want to beat carbon, it's the only way to do it unless you change the chemical charts." So says Jack Robertson about the prospects for making ammonia the world's go-to liquid fuel and renewable energy storage medium. Robertson is chairman and CEO of Light Water Inc., an ammonia energy storage startup. The carbon he mentions refers, of course, to the major carbon-based fuels of oil, natural gas and coal that provide more than 80 percent of the world's energy. The charts he mentions refers to the periodic table of elements, a listing of the basic elements of the universe which are about as likely to change their properties as the proverbial leopard is to change his spots. Most of us think of ammonia as a pungent household cleaning agent that disinfects and deodorizes. Farmers are familiar with anhydrous ammonia (essentially ammonia that is not mixed with water) that is a common nitrogen fertilizer. In lieu of my regular weekly piece, I'm posting a link to a radio interview I did last week for the Progressive Commentary Hour as I take a brief hiatus. I was privileged to be on with Nate Hagens, former editor of The Oil Drum. We focused on the effect of peak (affordable) resources and climate change on the economy and society. I was pleased that host Gary Null had such a deep understanding and appreciation of the issues we discussed. You can find streaming and downloadable versions of the interview on the Progressive Radio Network site by clicking here and then scrolling to the bottom of the page. It is awe-inspiring to view images of galaxies and nebulas brought to us by high-powered, space-based telescopes. And, it is even more amazing to see depictions of such phenomena as if we, the viewers, are suspended in space a long, long way from Earth. In fact, in modern science fiction movies and television shows we are regularly treated to adventures that take place wholly outside of our solar system and even outside our own galaxy. 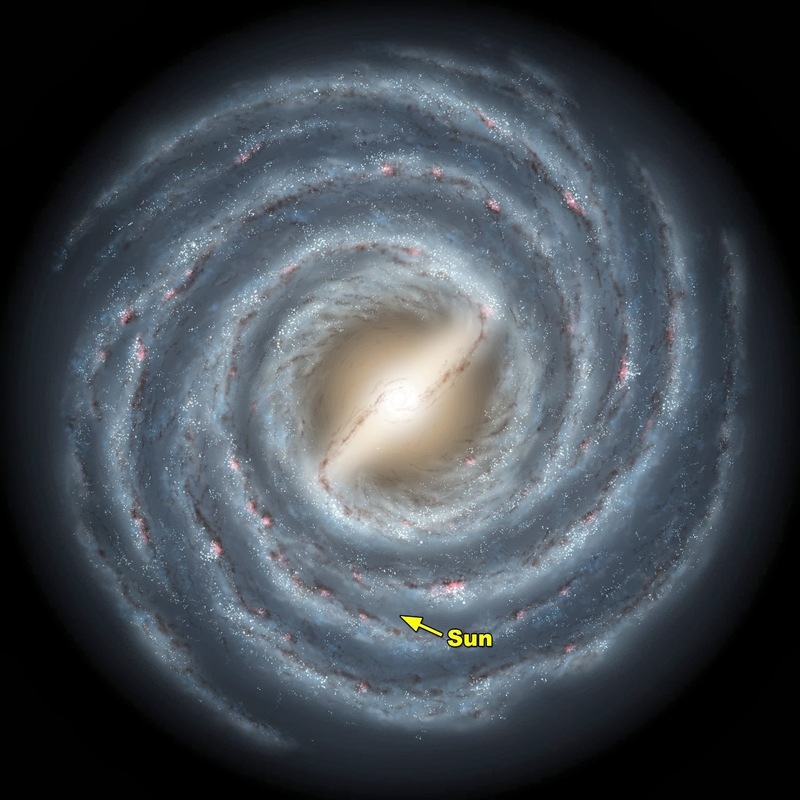 But there arises an obvious question when one looks at, say, an artist's rendering of the Milky Way with our place in it highlighted: Who is seeing the Sun, the solar system or the Earth from that vantage point? The answer, of course, is no one. No human has ever seen the Sun, the solar system, or the Earth from that distance. And yet, we can conjure such a point of view and imagine through special visual effects that we might someday actually see such sights with our own eyes. In fact, some people claim that it is only a matter of time before we do. This is the distance the mind can travel using physics. Physics is "the science that deals with matter, energy, motion, and force" according the dictionary. It is the world of "res extensa," literally, "extended things." It presumably operates without respect to humans. If we humans weren't alive, physical laws would still hold in the universe; and, the world of objects, of "res extensa," would still exist. Physics offers a bodiless, infinite view of where we live. 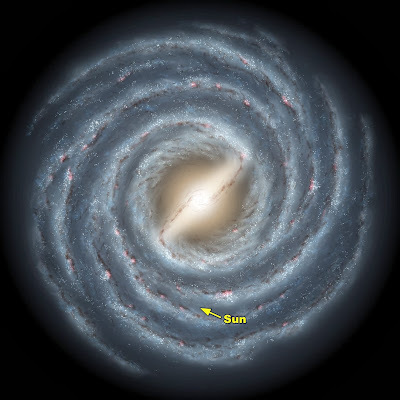 According to physics we live in the universe. Last fall at the Shareable Cities Summit in Portland a panelist from Getaround, the car sharing service, made the astounding statement that car sharing had the potential to reduce the number of cars on the road by an order of magnitude--for the math-impaired that means 90 percent. The received wisdom is that we are heading toward 2 billion vehicles on the road in the next 20 years, a doubling of today's 1 billion. This is put down primarily to auto demand in India and China. I've doubted this wisdom from the start because of obvious constraints on the liquid fuel supply. But virtually no one in policymaking circles believes that vehicle numbers are headed downward, let alone dramatically downward.